Can somebody explain why C is the correct answer? The rings all consist of 4 quarters that are coloured black or white. However, these quarters alternate between having been split along diagonal lines or along horizontal vertical lines. Even though you cannot see which way the first ring is split, it must have been along diagonals to allow for an alternating pattern. Only answer C allows that pattern to continue. Not the answer you're looking for? Browse other questions tagged logical-deduction sequence or ask your own question. 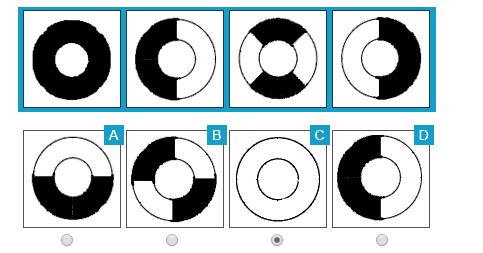 How to solve this IQ test puzzle with arrows and pied squares?